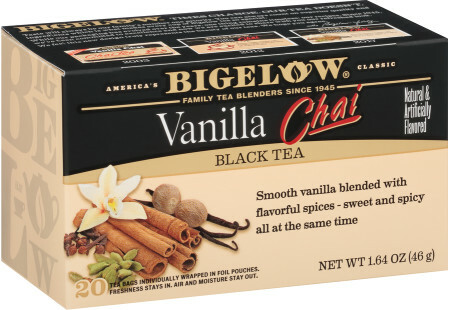 The perfect combination of sweet and spice using Bigelow's Vanilla Chai tea. It's rich yet refreshing. Boil water; place Bigelow Vanilla Chai tea bags into teapot and pour boiling water over tea. Let stand 3-5 minutes. Froth milk by using a latte-whip (an inexpensive gadget for whipping milk and other drinks available at any kitchen shop). Add 1 tablespoon (15ml) brown sugar to 4 teacups, pour in tea and top with frothed milk.